GitHub - nullbitsco/ESPRemoteSerial: Remote network serial monitor emulator for ESP8266 and ESP32. 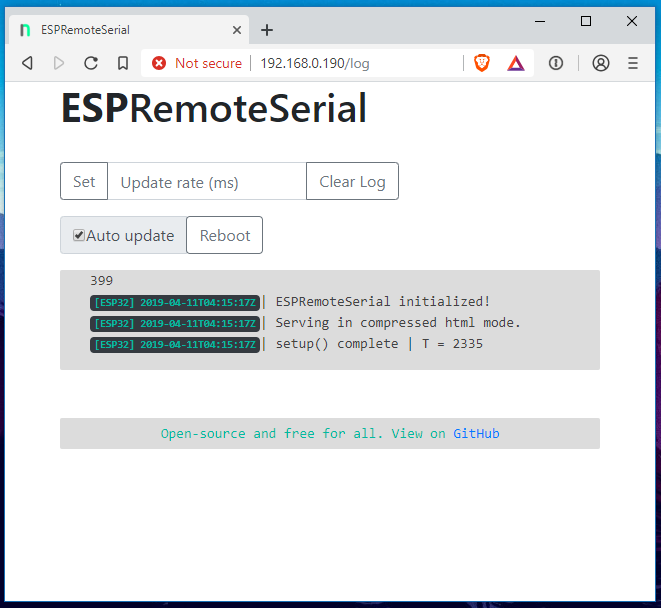 Remote network serial monitor emulator for ESP8266 and ESP32. Want to be notified of new releases in nullbitsco/ESPRemoteSerial? Remote (network) serial monitor for ESP8266 & ESP32. Install the dependencies, and their required dependencies, from the section below. Add this library to the Arduino library, either by downloading it and adding it as a .zip, copying it locally into the libraries folder, or adding this repo address into the Arduino library manager list. #include <ESPRemoteSerial.h> in your .ino sketch file. SPIFFS (ESP internal) is required to store the local logfile. It won't yet work without the filesystem present. See complete examples in the examples directory. Call ESPRemoteSerial::print(). Supports formatters in the same way printf() or std::cout does. Visit http://local_ip_or_host/log (i.e. 192.168.1.101/log) or the hostname if using mDNS (i.e. wifithingy.local/log). Since the logger is persistent, it will load messages logged before loading the remote log.